Last week, I travelled to Macau as a representative of China Holidays to take part in a familiarisation trip. Macau had always seemed to be foreign to not only me but the majority of the British population. When we think of Macau, it is seen as a destination that requires no more than a day at the end of a Hong Kong-centric holiday, or a location that’s main focus is on gambling and casinos. 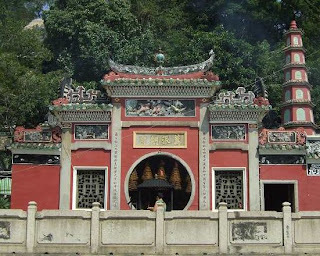 However, whilst on the fam trip, my tour guide, who was of Portuguese descent, opened my eyes to the wonder and history that Macau has to offer and explained to me how Macau is attractive in so many different ways besides its history as the gambling centre of the East. 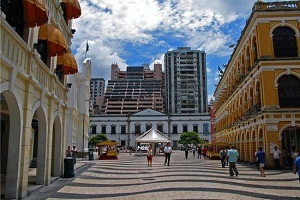 On my first day in Macau, I was taken to the historic centre of Macau in the northern peninsula section of the region. This walkable area is made up of an array of UNESCO world heritage sights, and is where tourists can really experience the Portuguese influence on the city. The majority of the buildings are brightly coloured, and ooze with catholic influences that seem so foreign in the rest of East Asia. We also took a visit to the A-matemple. As 75% of Macau’s residences are staunch Taoists, it was fascinating to see how these people worshipped the goddess of Sea-farers so adamantly, by lighting incense and praying in front of her statue. In the evening, we walked Senado Square, the heart of the Peninsula where decorative Portuguese mosaic tiles pattern the floor so eye-catchingly. The next day we went to one of the highest points in Macau to see the Guia Fortress and lighthouse. 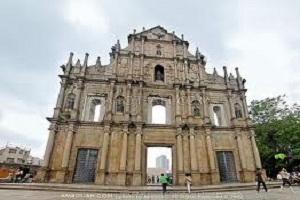 This UNESCO heritage sight was built in the 17th century to protect Macau from a failed attack by the Netherlands. Afterwards, we went to the Grand Prix museum and the Macau wine museum. The Grand Prix museum celebrates the Formula 3 race that takes part within the city of Macau. For one week in November, certain roads in the city are closed off for this annual event which brings with it great entertainment and sophistication that seems so fitting in Macau. The wine museum opened my eyes up to the wide selection of Portuguese wines available in Macau, and discouraged any negative thoughts I had previously had on Chinese wine. On our final day in Macau, we visited the MacauTower. 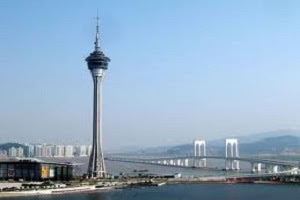 As the highest building in Macau, the Macau tower offers a wide selection of activities, including the opportunity to walk around the edge of the tower at its highest point as well as having the unnerving chance to bungee jump off the tower! 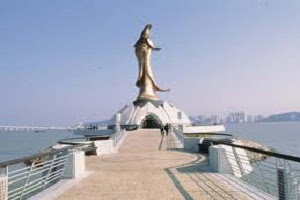 We later visited Macau’s 3 beaches in the southern part of the city. Similar to those in LA or the south of France, the beaches stretch for a long distance and are coated in golden sand and beautiful beach house architecture. Like the rest of China, Macau is the home to some of the most delicious food on the planet. What is truly delicious about Macanese cuisine is its ability to so perfectly blend Chinese and Portuguese influences that gives both a unique yet strangely homely and familiar feeling to the taster’s palette. Macau is also home to the legendary Pastel de nata, a Portuguese style of egg tart, differencing in its use of short crust pastry and strong mouth-watering flavour and taste. Macau is truly a city of surprises. Yes, casino-culture is extremely apparent in the city and brings about the majority of the city’s revenue and tourist capacity (primarily from the PRC); and yes, playing in the casinos for a short while is truly fun and a real experience. However, what the city has to offer on top of gambling is much more appealing to me, and to all the other travel fans like myself, I would imagine.